Following on from the previous post on ‘Simplifying the Enterprise Canvas‘, a few more notes on how to use the notation, and some practical matters on modelling. 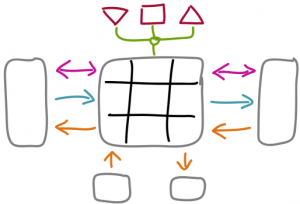 Perhaps not quite as technical as some of the other recent posts, but I’ll admit that if enterprise-architectures and the like are not of much interest to you, you might want to skip this one. If that is of interest, though, please do read on! All of that implies that the Service-entity will need at least one more parameter, and probably several of them. The minimum requirement would be a free-form text field, probably to be used in wiki-style format. A separate and distinct description-field would be useful, too, to help build a service-glossary and service-catalogue. It’s simple enough to add this in the toolset-metamodel: it just needs to be done from the start, that’s all. 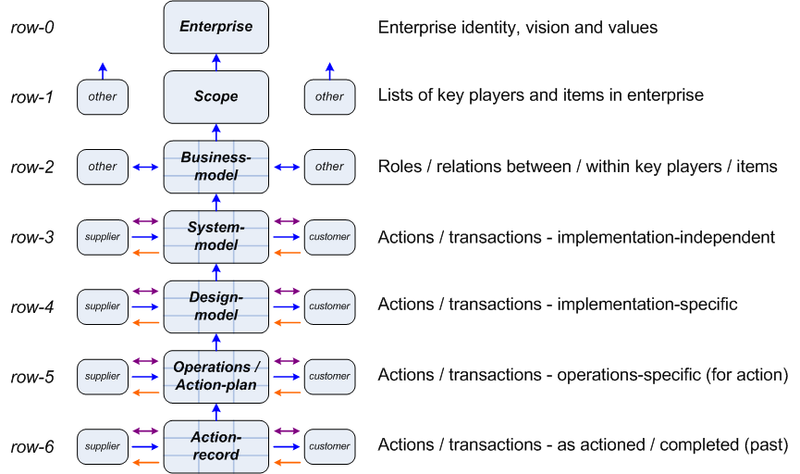 A reminder that the layers or ‘rows’ in Enterprise Canvas parallel those in Zachman: they are layers of abstraction – not arbitrary pseudo-’layers’ of implementation, as in classic IT-centric ‘enterprise’-architecture. 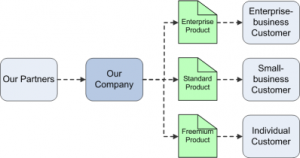 The ‘row-0′ above the Zachman set provides compatibility with ISO-9000 and the like, and represents an unchanging permanent-anchor – specifically, the shared-enterprise Vision and its concomitant Values. What was the source of the difference? What can we learn from this, to do differently next time? In Enterprise Canvas, we use realization-relations to link between rows – and only between rows. 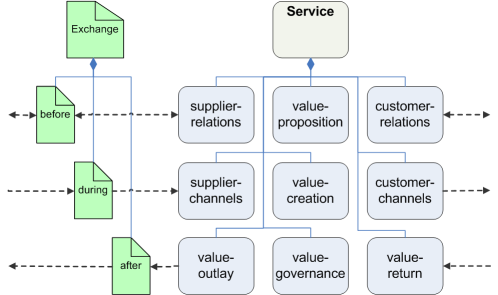 We don’t use realization-relations to connect between the pseudo-’layers’ (‘Business’, ‘Applications’, ‘Technology’ etc) in TOGAF and Archimate and the like. 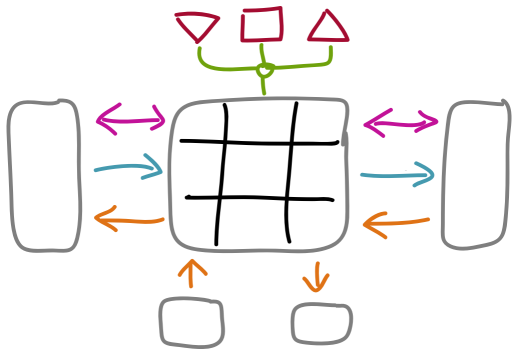 If we’re working only within one row, we don’t need (or use) any realization-relations in our model. 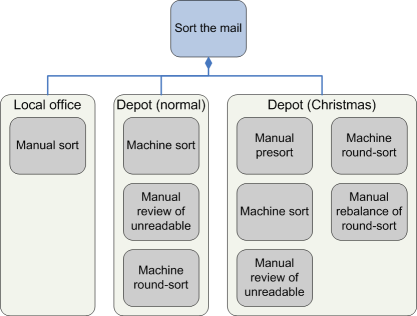 We only use realization-relations to describe linkages between different layers of abstraction, such as how a specific implementation realises a business-need. 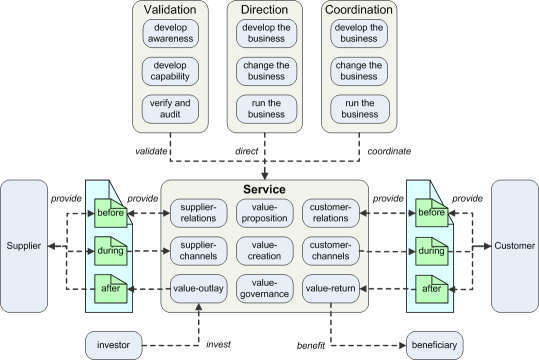 The relationship between ‘Business Object’ and ‘Data Object’ is correctly shown here as a realization: it crosses a boundary between layers of abstraction. However, all of the other links would be shown in Enterprise Canvas as variations on a theme of composition – i.e. relationships that do not cross layer-boundaries. ‘Containment’ is a popular space-saving technique supported by many toolsets, such as Phil Beauvoir’s excellent free Archi cross-platform toolset for Archimate (funded by UK JISC). Within the model, an entity can ‘contain’ other entities, which usually implies that the ‘child’ entities have composition-relations with the ‘parent’. However, do beware that in some cases, the ‘containment’ may actually be a realization-link, not a composition-link. A very common example is where we would want to show an implementation-independent (row-3) service ‘containing’ the implementation-specific (row-4) services that bring that higher-level abstraction into reality. The catch is that that’s a realization relationship – a transition between rows, or layers of abstraction – rather than a simple matter of granularity within the same layer. Hence if we use ‘containment’, we need some means to distinguish between composition-relations and realization-relations for the implied links between the ‘parent’ and its ‘children’. It would be good if the toolset could manage this automatically for us, but in almost all cases we should be able to do this manually if need be. The Exchange-entities represent whatever passes between Service-entities in a flow-relation between each other. 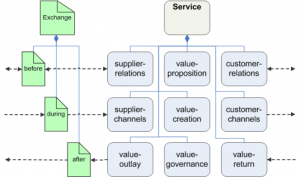 This is probably the best way to model Exchange-entities if there’s a strong emphasis on flow-content – as there is in VPEC-T analysis, for example, where we focus on what a service would need or provide before looking for other services that would provide or consume that inter-service content. The disadvantage of the ‘attached-Exchange‘ option is that it’s not well suited to showing a split into subsidiary-Exchange items linked to the attached ‘parent’ via composition-relations: visually it becomes too messy, and hard to ‘read’. If you need to show composition / decomposition, use the in-flow format instead. Ideally, the toolset and its metamodel should be able to support both display-formats. If it can support only one variant, use the in-flow format, rather than the ‘attached’ format. Remember that one of the key aims here is to keep things simple, without ever dropping down into the over-simplistic. 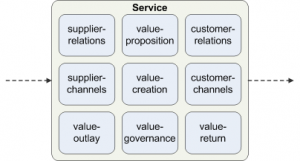 If we ignore for the moment the row-0 special-case of the Vision and Value entities, there are only two entity-types in the entire notation: Service, which does something; and Exchange, which represents something that passes between services. That’s it. 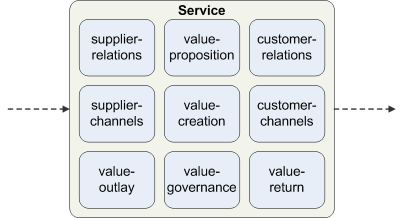 Because of that principle that ‘everything is a service’, it should be straightforward to substitute a graphic or photograph for the Service-entity in a model – which should make it much easier to create variations of models that will make visual sense to executives, line-managers and other non-architects, whilst still retaining the formal rigour of the model beneath the visible surface. It would be helpful if the metamodel could also include common non-semantic items such as groups and junctions and annotations, but they’re not required as such for the notation: they’re just useful. And because the notation is so simple, it allows the true complexity in the context to emerge and surface cleanly through the modelling process. We don’t get distracted by arbitrary pseudo-’layers’: it’s just the enterprise, as enterprise. But that’s about it, really. Very simple. And yes, best to keep it that way as much as we can. 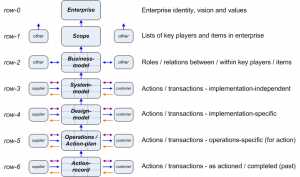 The original Enterprise Canvas is compact and concise, but it’s likely to be hard to implement in any of the existing EA toolsets. (That original notation is still probably the best for rough-sketches on paper or whiteboard, though.) This simplified version is somewhat less concise, but it would be much easier to implement in an EA toolset, and easier for us to increase its uptake and more general adoption across the EA disciplines. Ultimately, though, just choose whatever works best in the context! Comments / suggestions as usual, if you would? Many thanks for reading this far, anyway.